When John’s Hennepin County home was built in 1963, wood was a popular siding material because of its beauty and price point. However, homeowners that embraced this trend had several similar complaints. These include the fact that it’s prone to dry rot, requires routine maintenance, and has minimal natural insulation. Recognizing that his wood siding was failing and understanding that we are one of the top siding companies in Minnesota, John reached out to us to discuss his project. While siding was a primary concern, other areas of the home he wanted feedback on included windows, gutters, and insulation. We advised him that there are lots of reasons why it’s to a homeowner’s benefit to replace their siding and windows at the same time. Here’s how the home’s exterior looked prior to us commencing work. Here’s a rundown of the products John picked to give his home a whole new look. Siding: Diamond Kote® is a unique pre-finish built on LP® SmartSide®. Educated homeowners understand the importance of iron-clad siding warranties and LP® SmartSide® does not disappoint with their industry-leading 30-Year No Fade Warranty. Homeowners appreciate that they can choose from 30 modern colors or create a custom color of their own. In this case, it was important to select a color that remained true to the home’s architectural style and neighborhood. However, because the siding has such a substantial lifespan, it was important to choose a tone that would stand the test of time. Ultimately, John chose Pelican, from Diamond Kote®’s Dramatic Bolds line. This line was created with the intention of creating depth and emotion in order to produce stunning results. Insultex® House Wrap was used to reduce drafts and increase energy efficiency. home by reducing drafts and increasing energy efficiency. As an additional measure, new fiberglass batt insulation was installed in the exterior walls to provide a cozier home. Windows: The Upper Midwest is home to over 200 window manufacturers. When picking the company to manufacturer SeasonGuard Windows, we felt it was important to know that they provide outstanding warranties, maximum energy efficiency, and an expanded visible glass area to allow in as much natural light as possible. Our experience with them allows us to consider them the best windows for Minnesota’s climate. John’s home windows were a combination of casement and awning. To offer even further curb appeal, we installed burgundy colored shutters. Here’s how the completed project looked. Rain Gutters: When partnering with a company for seamless gutter installation, the top priority for most homeowners is finding a product that’s aesthetically pleasing and maintenance-free. 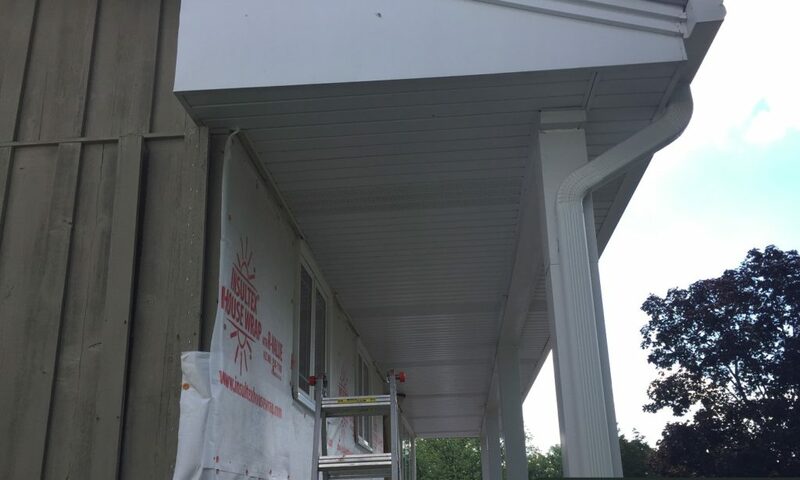 LeafGuard® Brand Gutters were the perfect exclamation point for this home improvement project. Not only is the patented system guaranteed never to clog, but also their patented seamless design gives the allure of crown molding on a home. "Looks great. Had heavy rain and everything looks good." - Patrick K.
"We love our gutters. The work was fast and professional." - John B.